Branded social media accounts are for the bold. While they allow you to interact with a global audience in real time, the damage caused by the wrong post gone viral can be permanent. But then again, he who risks nothing gains nothing. I mention this in context of the potential public relations risks associated with allowing employees to take over a branded social media account. The idea of an employee-driven Twitter account might make your PR team cringe, but would you be willing to take the leap if it meant a 46% increase in followers? In this MarketingSherpa Blog post, I wanted to share a recent interview I had with Deloitte’s Senior Manager of Employer Brand, Lisa Monarski. We touched on some of the things she has learned from managing a branded employee Twitter account. In 2010, Deloitte identified an opportunity to increase the force of its value proposition through Twitter, an emerging medium for B2B marketers at the time. The key thing to remember here is that in order to answer the question, you have to get inside the mind of the customer and see your offer through their eyes. If your prospects are recruits, there is no better way to do this than to let your employees answer the question for you because, as one-time recruits themselves, your employees identify with your recruiting prospects. And so, the @LifeAtDeloitte handle was born. By using this handle, Deloitte was able to convert the attention of recruits into legitimate interest. The account was an opportunity to increase appeal, credibility and clarity of the company’s value proposition. MarketingSherpa: What prompted you to start an employee-run Twitter account? MS: Who is your target audience? LM: Our target audience is anyone who wants to know what it’s like to work at Deloitte. We think that anyone from a college freshman up through a seasoned professional looking for new challenges can gain insights into our culture and people by following @LifeAtDeloitte. MS: Who (or what) was your inspiration to start an employee-run Twitter account? LM: Our people were the inspiration for this strategy. Whenever you ask someone questions like, “What brought you to Deloitte?” or “Why have you stayed here for so long?” etc., the answer is consistently the same: It’s the people. We have a very engaging and collegial environment here. Creating a channel where we could feature our people and give them the microphone, so to speak, seemed like an authentic approach to highlighting those who work here. MS: How do you select the employee who gets the handle? LM: We help our followers – more than 15,300 now – experience a good cross-section of Deloitte. Guest tweeters range from new hires and first year auditors or consultants up through some of the more senior leaders of the organization. We make sure to represent our various functions – audit, consulting, tax, enterprise risk and financial advisory. We also use the account to promote the programs that demonstrate our values such as Warrior Games, Olympics, IMPACT Day, Alternative Spring Break, or our presence at national and global events such as Davos or SXSW. MS: Do you brief them before they receive access to the account? LM: Deloitte has social media guidelines and training programs in place as well as policies to protect our clients’ confidentiality. Our guidelines help our people develop strong networks and their personal brand both inside and outside of work. Every professional who takes a turn as guest tweeter is given a written guide of leading practices. They also participate in what we call a “primer” to discuss the tactical side of managing the handle. It’s truly the professional’s authentic voice that you see in the tweets. MS: How is this affecting your brand? LM: We think it has had a very positive effect on our brand. The @LifeAtDeloitte handle reflects the different opportunities, programs and the quality of people who work here. It’s a very active account also – a lot of retweeting, replies and mentions. What better way to reflect our brand than by being able to hear from and interact with our professionals every day? MS: What effect has this had (if any) on employees? LM: In the last two years, @LifeAtDeloitte has become a destination for our people – not only as followers, but as guest tweeters. Our schedule for guests is often booked six weeks in advance. Our professionals are excited to share their stories and perspectives. MS: How are you measuring the success of the @LifeAtDeloitte handle? LM: We are interested in the growth of the number of followers – we saw a 46% increase this past year alone. Measuring impressions gives us an indication of our alignment with current topics like #SXSW and influential followers, and we regularly check our engagement to know what topics resonate with our followers. 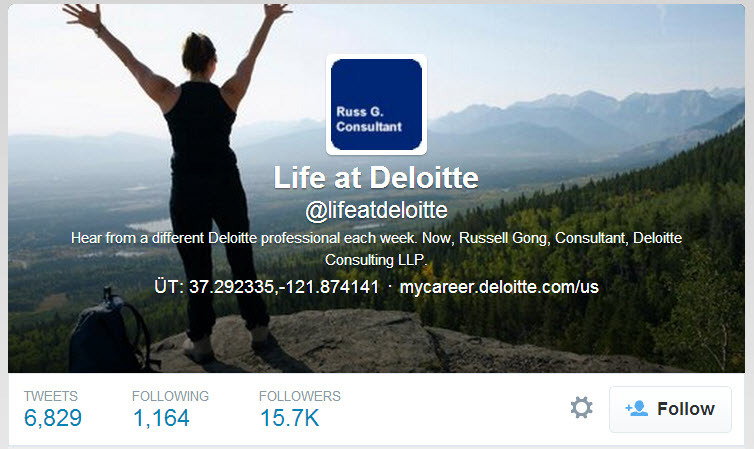 Since the 2010 handle launch, Deloitte has seen a growth in followers from colleges, universities and career centers. A big factor that increased the success of the handle was the team’s ability to effectively express their value proposition in a fresh new way that resonated with their target audiences. If you would like to start your own “value prop” handle, Lisa suggested involving legal and branding teams. It also doesn’t hurt to have a set of social media guidelines and a crisis management plan in place. What a fascinating idea – thank you for sharing, Maria! Wow! you took the people out of social. What does it mean when a green box says; “Family and I are looking forward to Saturday…” or “Headed to local YW luncheon recognizing women” This is how a PR company controls the conversation — that’s not a bad thing, especially for Deloitte but, re-tweeting filtered comments does not look like an “inside” view of the company. I love this idea! And feel that it is very applicable to small businesses where it would require less process, but the same awareness and training. I look forward to encouraging our clients to try this out as they get to the Engage part of our Online Presence Maturity Model where you not only engage your clients but also your employees. Thank you! Glad you enjoyed it Melissa! Thank you for reading Martha, I’m excited to see how you apply this! Hi Maria, the two things I like best about this concept is “insourcing” your public relations with a multitude of employees AND the fact that you are doing it through the Deloitte social media account(s), rather than expecting staff to make use of their own (personal) social media accounts (a concept I am very much against). I look forward to an update on how Deloitte’s employee program progresses.